Denim - Dittos (Shop Top), Blouse - Joie, Blazer - Alfani, Heels - Pink and Pepper, Clutch - Francescas, Ring - Bohypsy, Necklace - BlueBird, Nail Polish - Nicole by OPI "Love Song"
Fab look, lovin the jacket and its colour is stunning on you! Loving the chequered shirt & the yellow jacket! That shirt is just perfect! Pretty style. Love your yellow blazer with the blue shoes and that gorgeous white and black blouse. Love the B&W&Yellow combos !! and the blue shoes... love it ! Love this color on you dear! And the pop of blue is perfect! love yellow & blu color matched ! Amazing blouse; the pattern is really great. You look fabulous as always!! These jeans are rockin on you! You hardly ever wear jeans, but I'm digging it!! And that top is to-die-for...I love houndstooth!! We are wearing super similar looks today on our blog! What girl doesn't love a great pair of blue heels! Lovely outfit, really like the yellow and cobalt together! Those pants are flawless on you. Love this look, hun. I love the yellow blazer, makes me crave for spring. You look beautiful! Loving everything about this!! Especially that blouse! Amazing! Super cute~! I love that blouse. LOVE this simple look with the bold yellow blazer and fun blue heels. Gorgeous look! I love your heels. Love all the color! Great look! Love this outfit. this is something that I could totally wear, even chasing after my son, ok well minus the heels. The top is stunning. Don't forget to enter my stella and dot giveaway and i'm also hosting a link up this thursday about how you would style cobalt.Hope to see you there. Wow, adore this outfit. So chic and professional. I could see myself wearing this to work. Great. Love the pops of color. You always inspire me to wear brights. Love the color! I love a good cobalt pump, I have a pair from Chinese Laundry that always add the perfect finishing touch to an outfit! Obsessed with your heels. So so cute. Great look on you. Love when you do the bright colors. They look amazing on you. That's an absolutely gorgeous necklace! As for those heels, I'm still jealous of them and their gorgeous color. That necklace is so gorgeous!! Love the casual look! Love the yellow and blue combo! The blazer is simply amazing! Its color is so fresh! I LOVE your houndstooth top! :) So gorgeous! I love this outfit. You look fantastic. The blue heels are amazing! Gorgeous outfit, as always. The heels are amazing. LOVE this outfit! That blazer is fab! i love pairing yellow and blue together. something about that combination just makes it really contrast and pop. This outfit is PRECIOUS! Love the pops of yellow!! I am always afraid that yellow + black = bubble bee - you sure do not look like a bee. Love this combo with the blue touch! You have amazing style love how you always mix colours prints etc . your suede blue kicks are AMAZING!!! 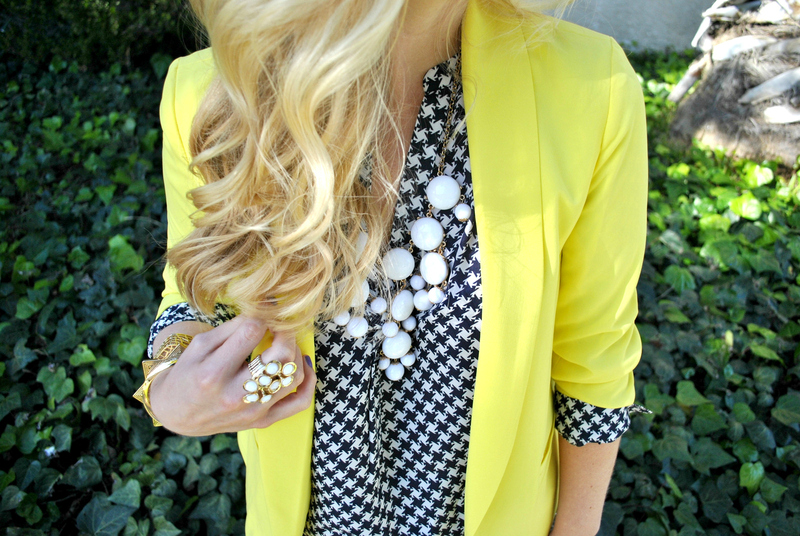 Love the yellow with the houndstooth! So cute! Cute! I love the houndstooth and the blue. The entire look rocks. you look good in them! This is such a fun and detailed outfit. Those heels are stunning -- I'm way too much of a wimp to pull them off, but you look great! I adore this outfit! The yellow blazer is fab! Thanks for stopping by my blog! You're darling. :) Glad to be following you so I can get some fashion tips. LOL.